With $1 Billion in Buybacks Coming, Is It Time to Buy This Oil Stock? Oil refiner HollyFrontier's management announced a large share repurchase program this past quarter that might have more investors interested in its relatively cheap stock. 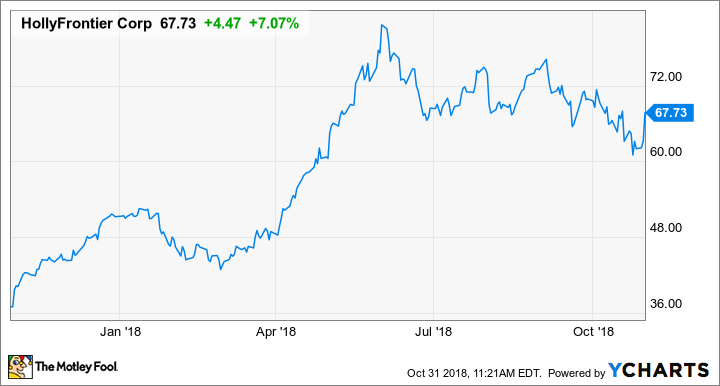 The past 12 months have been a great time to be an oil refiner, and HollyFrontier (NYSE:HFC) has taken full advantage of the recent market to generate gobs of cash. In fact, the company has generated such strong earnings and cash in recent quarters that management wants to give back about $1 billion of it in the form of share repurchases, and that's on top of its dividend. With management in a position to give so much cash back to investors, is it perhaps time to reconsider an investment in HollyFrontier? Let's take a look at the company's most recent results and management's outlook to see whether this is the time to buy. DATA SOURCE: HOLLYFRONTIER EARNINGS RELEASE. EPS = EARNINGS PER SHARE. This was another solid quarter for HollyFrontier, which benefited immensely from crude oil price discrepancies across North America. In fact, third-quarter earnings were even better than the reported number because of a noncash inventory valuation charge. Absent that charge, the company reported an estimate-crushing earnings-per-share result of $1.98. These inventory charges and credits are part of the company's fair value accounting and happen every quarter. From an investor's perspective, it's not too much of a concern. While the company is still getting slightly better results from its lubricants investments and its equity stake in Holly Energy Partners, the driving force for the quarter was its refining segment and converting cheap crude to refined products. Some of the cheapest sources of crude oil today are heavy and sour crudes out of Canada. HollyFrontier's refinery system is set up to use a lot of this crude -- up to 20% of total processing capacity. Management noted on its conference call that the difference between a barrel of Western Canadian Select and the West Texas Intermediate was as high as $45 per barrel during the quarter. Data source: HollyFrontier. Chart by author. What's perhaps even more surprising about the earnings beat and strong earnings results was the fact that it went through a heavy phase of turnaround and maintenance work in the quarter that shut in some processing capacity. The company also announced that it had completed its previously announced acquisition of locomotive engine lubricant supplier Red Giant Oil. The deal will help HollyFrontier expand its rack forward lubricant business -- the packaging, branding, and retail sales aspect of the lubricant business -- and will add about $7.9 billion in annual EBITDA. Management felt good enough about the company's current operations and the outlook for the industry that it initiated a $1 billion share repurchase program. With shares trading for eight times earnings, it's been pretty aggressive with share repurchases lately. In the press release, CEO George Damiris gave a brief overview of the recent quarter as well as what we can expect in the coming quarter in terms of downtime for its facilities. HollyFrontier's strong financial results reflect our ability to capture the favorable crude discounts across our refining system. In line with our cash priorities, during the third quarter we reinvested in our plants through both capital and maintenance spending, paid our regular dividend and returned an additional $124.0 million to shareholders in the form of share repurchase. Looking into the fourth quarter, we see normal seasonality in the gasoline markets and sustained attractive crude markets. We are currently undergoing turnarounds at our El Dorado and Mississauga facilities and plan to return to normal operations in November. You can read a full transcript of HollyFrontier's conference call here. Had HollyFrontier been able to maintain results like this, then today's stock price would look like an absolute steal. The company's ability to take advantage of some extreme price differentials between various crude prices makes for a pretty compelling business. The trouble is, it's hard to predict if it can maintain results like this consistently. The refining industry is viciously cyclical, and any changes to demand or crude prices can drastically alter a refiners prospects. A large reason for these crazy price differentials is a lack of crude oil pipelines and transportation bottlenecks. Those issues probably won't last forever as infrastructure companies plow billions into new pipes, storage, and even export terminals. As these get built out, crude oil prices will likely normalize across various regions and HollyFrontier's refining margins will decline as a result. At the same time, HollyFrontier's management is one of the better capital allocators in the business and has a good reputation for generating shareholder value over time by acquiring businesses at the right time or using share repurchases and dividends to reward investors. If you are looking for an investment in this industry, HollyFrontier is certainly a stock worth considering. However, the industry is riding an absurd high right now that may not last much longer, so it may be best to wait a while before pulling the trigger on this stock.